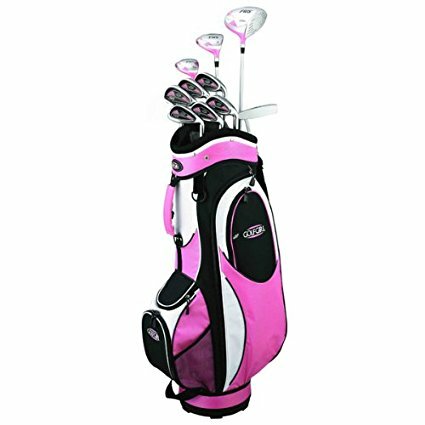 Golf Girl, a company that specializes exclusively in quality golf gear created for women, has designed the FWS2 Petite Lady Pink Hybrid Club Set and Cart Bag especially for women under 5’4”. The Petite Lady product features a set of clubs, headcovers, and cart bag: the complete package for new and experienced golfers alike. Petite golfers, rejoice! The FWS2 Petite Lady Pink Hybrid Club Set and Cart Bag features specially designed hybrids and irons to maximize the swing of shorter golfers. This versatile set features a driver with the largest legal hitting surface and a 3/4 hybrid. The 5, 6, 7, 8, 9, and PW irons round out this set, which gives golfers the tools to handle any part of the course. This complete set features graphite shafts, the preferred club material used my many pro golfers. Graphite shafts are ideal for women because of the lightweight material, which adds 2 to 4 mph to swings, and fewer shaft vibrations. The included pink and black deluxe golf cart bag includes plenty of pockets for storage of accessories, clothing, and valuables. Zippered club covers and putter round out this complete set. The FWS2 Petite Lady Pink Hybrid Club Set and Cart Bag has found its niche among petite golfers who rave about its ideal size, weight, and handling. The durability, looks, and roominess of the bag, as well as the availability of pockets, were a particularly desirable feature of the set.